Pastel and acrylic artist Gina Bickish is a Florida native. This fact is visible in her natural Florida-themed fine art. Bickish uses pastels on colored paper and wet-on-wet acrylics to depict the bright colors of Florida land- and seascapes, as well as florals and other natural works. A prolific and award- winning artist, Bickish has been inspired by and taken classes with the well-known "Florida Highwaymen" artist, R.L. Lewis. In both of her media of choice, Bickish combines bright colors with an "alla prima" technique (using little in the way of preliminary sketches and color underpainting) in her work. A typical Bickish pastel work will use the paper color and paper texture as part of the thematic signature of a painting. Her method allows for an efficient and sure composition, with very few—if any--preliminary sketches and much less color layering than traditional pastel. Bickish uses a similar method with acrylics, layering the composition over a colorful background (which shows through much of the painting) with little in the way of sketching. Bickish depicts scenes of her native Florida, as well as areas of the South and Mid-Atlantic where she has lived and visited. She depicts native flora and fauna (as well as garden plants), having spent most of her life in the country, pursuing her hobbies of identifying plants and observing wild animals. "In my childhood, I spent a lot of time in the woods, fields, and creeks surrounding my home and relatives' homes. Adults took the time to point out the little seasonal flowers, the fossils in the rocks, the raccoon and deer tracks. What a gift! The most enjoyable thing about being an artist is getting to go out and find the same kinds of things now. Who else gets to study clouds and bears both?" she relates. "I appreciate pastels for many reasons,” says Bickish. "One thing that few people realize is that they last for hundreds of years when archivally framed and protected from sunlight. Because there are few binders and the sticks are mostly pigment, the work will not turn color, as long as it is painted on archival paper.” Bickish makes a concerted effort to use the most lightfast pigments available. She explains, "I like the directness of the medium, juxtaposed with the soft effects they give. They provide accuracy in execution while conveying a variety of emotions." Bickish began working in acrylics more recently through her studies with Mr. Lewis. "Acrylics allow such a wide range of effects. Painting with them is like play for me...the wetter, the better! I even get to use my fingers sometimes," she enthuses. Bickish's work evokes many moods, whether mysterious, peaceful, fiery, or even whimsical. However, one thread is common to all of them. "The creation around us provides a never-ending supply of joy," Bickish points out. Bickish began her fine art education with private lessons from Mary Ann Kephart, M.F.A. She also studied art and art history at Hood College in Frederick, Maryland. Currently, she attends demonstrations and classes by Mr. Lewis on an ongoing basis. Combining her formal training with many other influences over the years, Bickish has created her own style of impressionism. She has won several best in show awards. "For me, Bickish's work casts a mood that reminds me of the many tropical days I enjoyed growing up in South Florida. I personally find the work moving, and her work increasingly seems to connect with our collectors," says Andrew Hyder, Curator, Hyder Gallery Center for Fine Art, Orlando, Florida. Bickish is currently expanding her gallery representation throughout Florida and the United States. Florida coquina wall and stairway with blooming Chinese flame tree. Height 16" x Width 14" x Depth 1"
One of the things I like most about our Florida home is the backyard. It has large trees and several naturalized areas with enormous elephant's ear plants. Ferns cascade over a coquina retaining wall. This painting captures the view one fall when the Chinese flame tree was in full bloom. 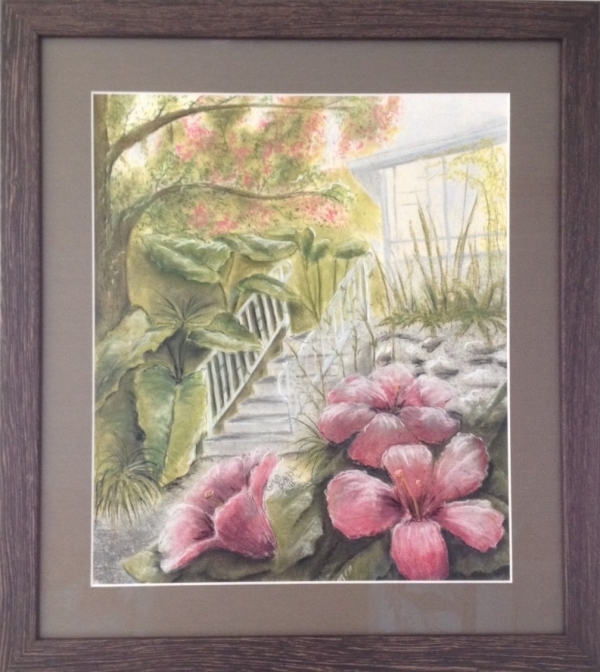 Gina Bickish Professional Artist Biography Pastel and acrylic artist Gina Bickish is a Florida native. This fact is visible in her natural Florida-themed fine art. Bickish uses pastels on colored paper and wet-on-wet acrylics to depict the bright colors of Florida land- and seascapes, as well as florals and other natural works. A prolific and award- winning artist, Bickish has been inspired by and taken classes with the well-known "Florida Highwaymen" artist, R.L. Lewis. In both of her media of choice, Bickish combines bright colors with an "alla prima" technique (using little in the way of preliminary sketches and color underpainting) in her work. A typical Bickish pastel work will use the paper color and paper texture as part of the thematic signature of a painting. Her method allows for an efficient and sure composition, with very few—if any--preliminary sketches and much less color layering than traditional pastel. Bickish uses a similar method with acrylics, layering the composition over a colorful background (which shows through much of the painting) with little in the way of sketching. Bickish depicts scenes of her native Florida, as well as areas of the South and Mid-Atlantic where she has lived and visited. She depicts native flora and fauna (as well as garden plants), having spent most of her life in the country, pursuing her hobbies of identifying plants and observing wild animals. "In my childhood, I spent a lot of time in the woods, fields, and creeks surrounding my home and relatives' homes. Adults took the time to point out the little seasonal flowers, the fossils in the rocks, the raccoon and deer tracks. What a gift! The most enjoyable thing about being an artist is getting to go out and find the same kinds of things now. Who else gets to study clouds and bears both?" she relates. "I appreciate pastels for many reasons,” says Bickish. "One thing that few people realize is that they last for hundreds of years when archivally framed and protected from sunlight. Because there are few binders and the sticks are mostly pigment, the work will not turn color, as long as it is painted on archival paper.” Bickish makes a concerted effort to use the most lightfast pigments available. She explains, "I like the directness of the medium, juxtaposed with the soft effects they give. They provide accuracy in execution while conveying a variety of emotions." Bickish began working in acrylics more recently through her studies with Mr. Lewis. "Acrylics allow such a wide range of effects. Painting with them is like play for me...the wetter, the better! I even get to use my fingers sometimes," she enthuses. Bickish's work evokes many moods, whether mysterious, peaceful, fiery, or even whimsical. However, one thread is common to all of them. "The creation around us provides a never-ending supply of joy," Bickish points out. Bickish began her fine art education with private lessons from Mary Ann Kephart, M.F.A. She also studied art and art history at Hood College in Frederick, Maryland. Currently, she attends demonstrations and classes by Mr. Lewis on an ongoing basis. Combining her formal training with many other influences over the years, Bickish has created her own style of impressionism. She has won several best in show awards. "For me, Bickish's work casts a mood that reminds me of the many tropical days I enjoyed growing up in South Florida. 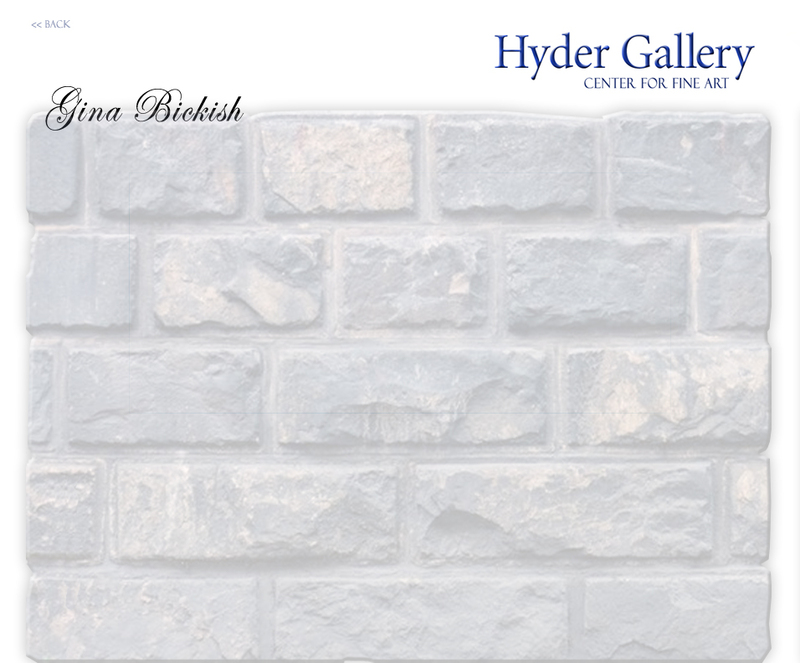 I personally find the work moving, and her work increasingly seems to connect with our collectors," says Andrew Hyder, Curator, Hyder Gallery Center for Fine Art, Orlando, Florida. Bickish is currently expanding her gallery representation throughout Florida and the United States. One of the things I like most about our Florida home is the backyard. It has large trees and several naturalized areas with enormous elephant<(1)>s ear plants. Ferns cascade over a coquina retaining wall. This painting captures the view one fall when the Chinese flame tree was in full bloom.